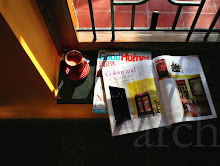 Today under Rang Decor Reader's Creative Spaces, I take you to a colourful Goa-inspired home in Bangalore. 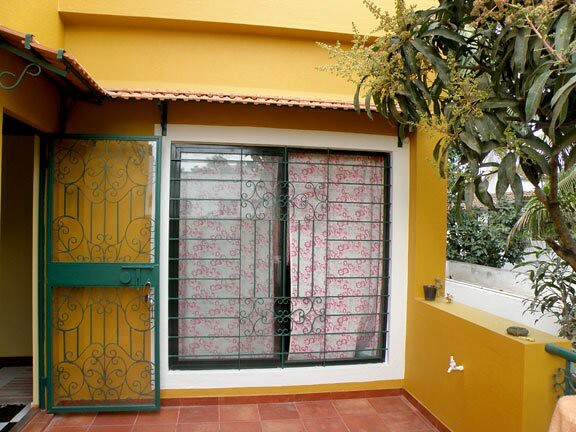 Mishta and Anirudh are a 30-something couple, both designers, one a product designer and the other a graphic designer, decided to build over Anirudh’s family home’s existing ground floor bungalow on a 60 x 40 plot in Sadashivnagar, Bangalore. The design of the house revolves around three courtyards and two trees. ...and a main courtyard, also on the second floor, at the front of the house, is designed to pay homage to Geoffrey Bawa’s tropical style with a pond and landscaping." 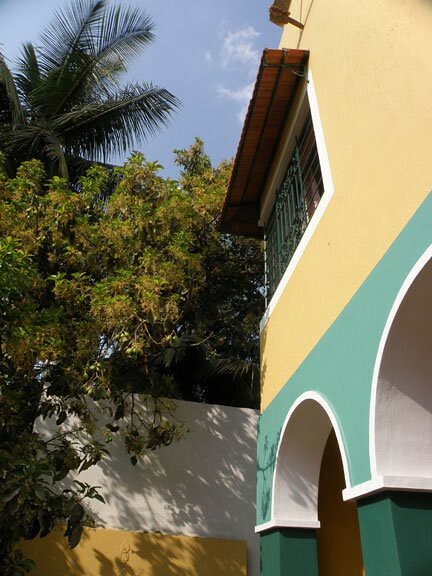 The over-arching theme of the house has been heavily influenced by the couple’s love for Goa, a destination they run off to, to recharge, every two and half months. 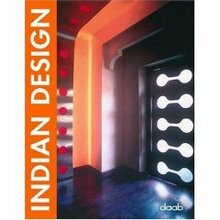 Mishta adds, "The idea was not to recreate a Goan house, but to pick Portuguese influences, through colour and form and combine that with the sense of an open Asian tropical house." 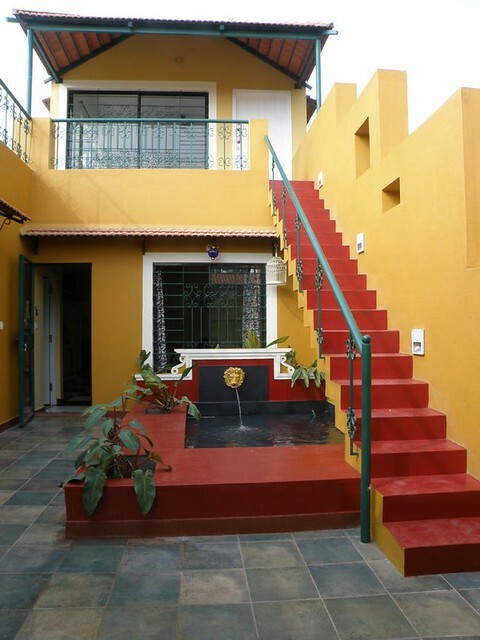 Mishta adds, "The main colour scheme for the house is yellow ochre and dark green. The flooring is cool green kota stone with small floral tiles inlayed at intervals. Common passageways are in black and white checks. 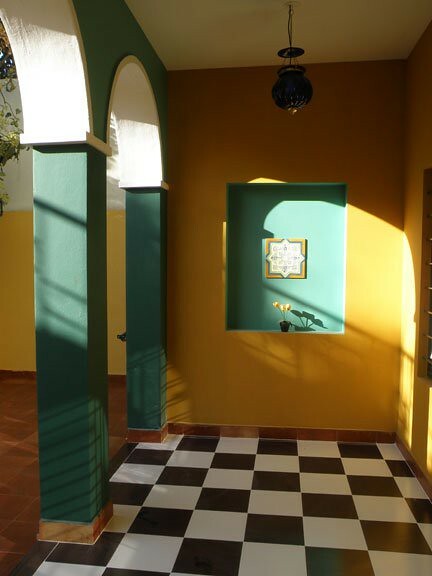 Rustic tiles in terracotta and green have been used in the flooring of the courtyards. 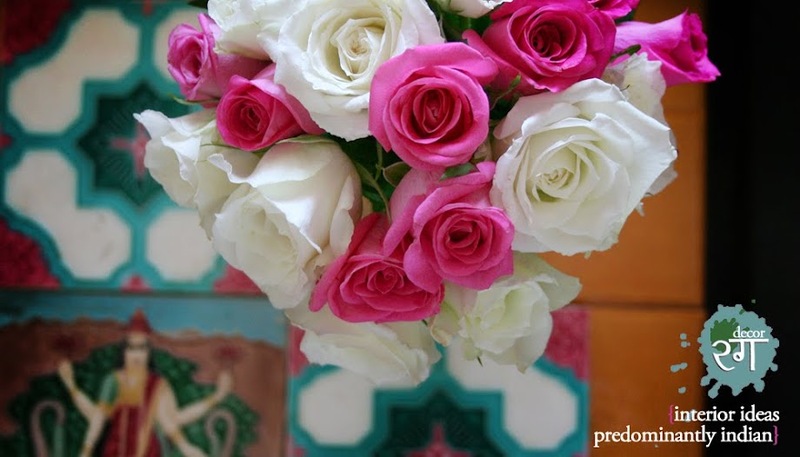 Ceramic floral tiles were sourced from Spain and fitted into niches in all the courtyards." 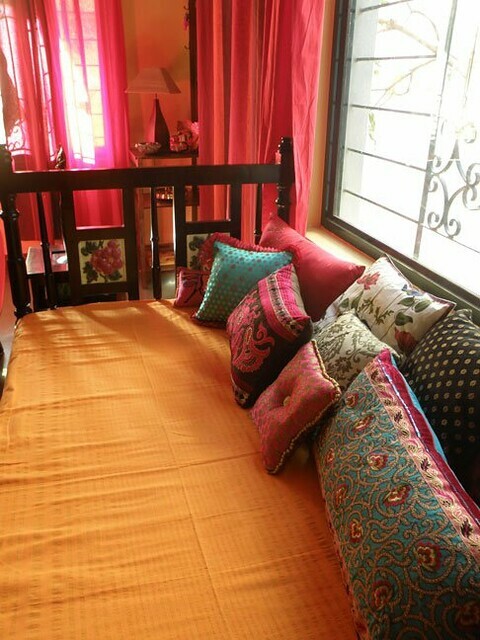 Mishta & Anirudh~ Thanks for sharing so generously photos of your vibrant home with readers of Rang Decor. P.S. 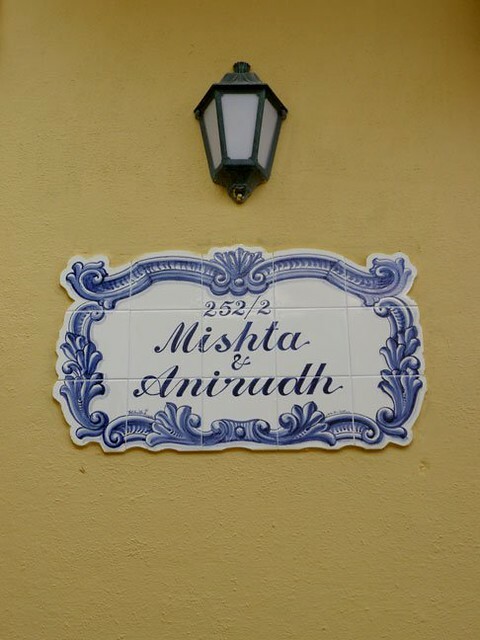 If anyone has any queries regarding Mishta and Anirudh's home, feel free to ask in the comments section. Absolutely gorgeous home with warm and vibrant hues!! Beautiful house and great shots too! What a beautiful home !! 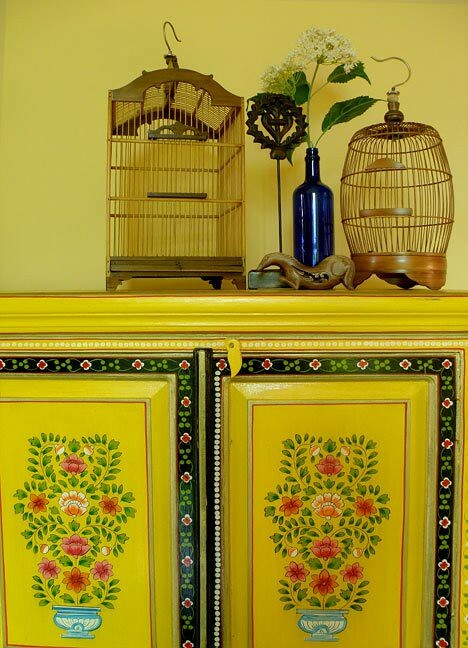 Love the painted yellow cabinet !! What a warm, beautiful home! A very warm and lovely home. 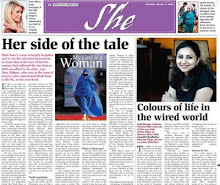 Loved the colours!! Good angles. Loved the black and white tiles. 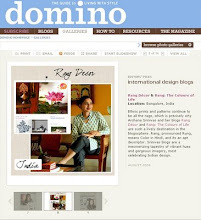 Awesome post, Archana, Loved every picture in the post. 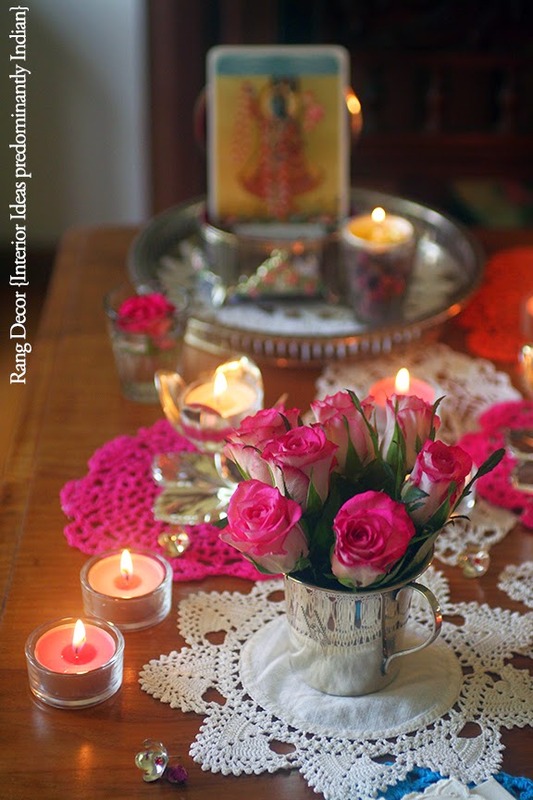 What vibrant colors...such a holiday mood to bring into one's daily lives. Love how they went into such detail on the tiles. Great to see you back on this series again, Arch! Beautiful home! 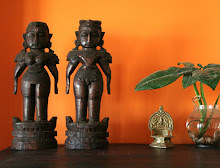 Archana you have a fabulous sense of decor and I love the home tours you post! I would love to find out more about the area rug/carpet in the living room, it's gorgeous! OMG! What a gorgeous home. They have completely transformed it. Congrats Mishta- Every part of your home is lovely! A beautiful home! Loved the red chatais...Great pictures!Thank you for sharing! Oh dear God! Easily the most beautiful home I have EVER seen! Just gorgeous and stunning! 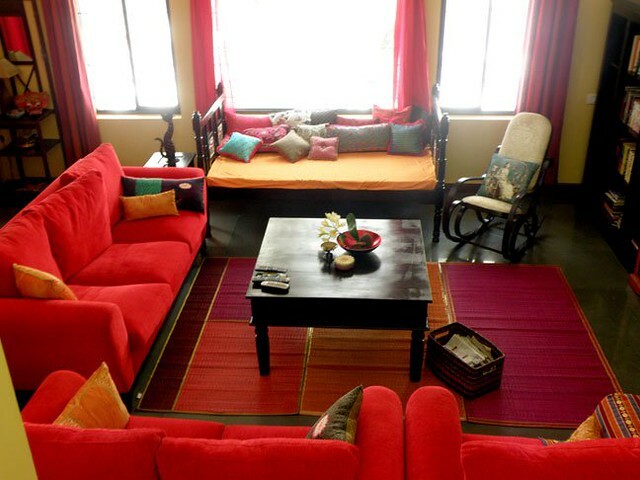 A color freak like me loves every single thing but that living room is just to die for! 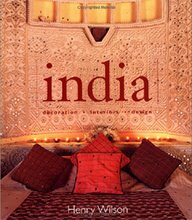 I have to somehow sneak an invitation to your home when I come to Bangalore Mishta! Fabulous post Arch! 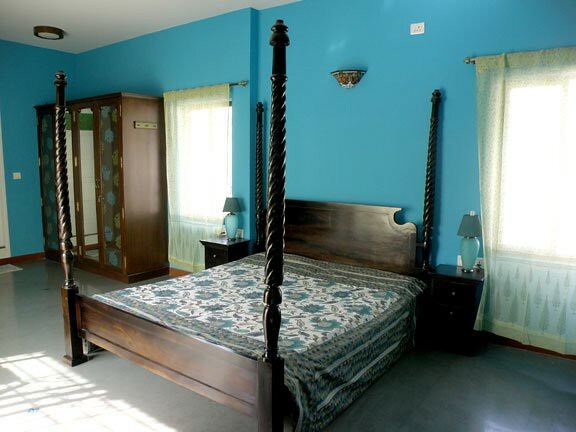 Gorgeous home, Mishta and Anirudh! I specially loved your guest room and that shabby chic cupboard. Utterly gorgeous and unique. Love the way the colours have been used. It has such a south indian flavour to it. Beautiful! What a colour-soaked home! It has tropical-ness literally stamped on every square inch. I looked at that water-body in the courtyard and kept thinking how much plants would love it. In my mind, I can see a forest of heliconias and orchids blooming their heads off there! 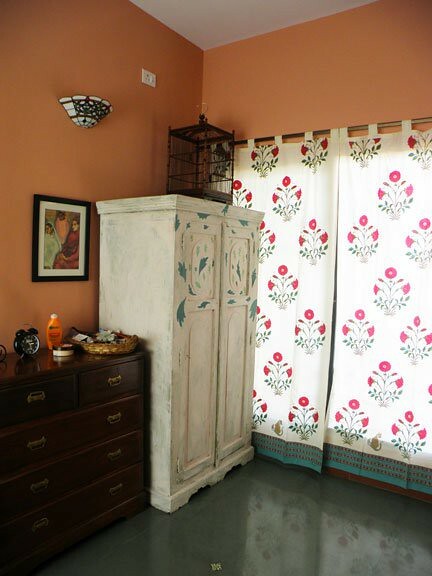 Mishta...just love..love...love the curtain in your guest room..would mind sharing where you gt them.Thanks. Nice interior. I love the design of the house. Very colorful, stylish and artistically made. Impressive house! You've done a great work. The curtains are from Good Earth, they're a bit expensive but worth it! The chattais on the living room floor are from Mother Earth, not expensive at all! This is a beautiful home! 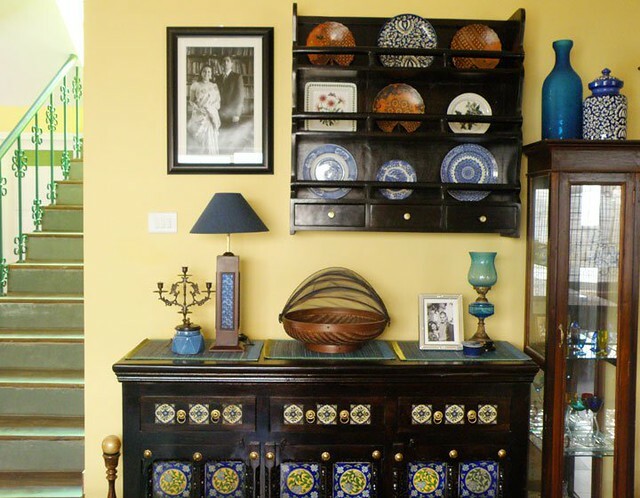 Every room is full of artistic vibrance and detailing. beautiful house. 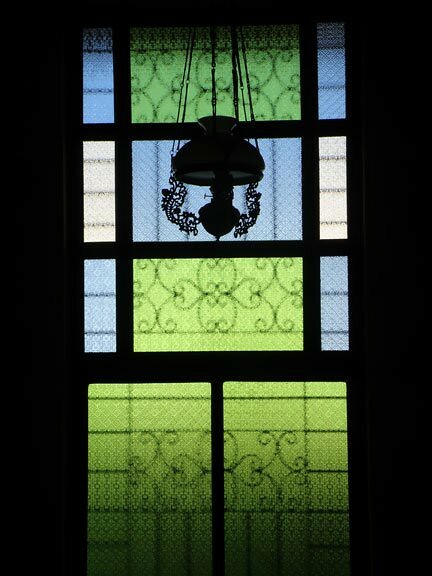 I really like those hanging lamps in your house. Could you please tell me from where you got those? I love your site, the photos are beautiful and inspiring! Thank You! The nameplate is very Goan. 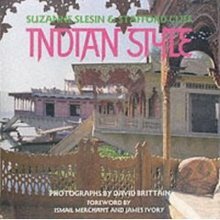 I am a Goan native, Living in California. Great pics. 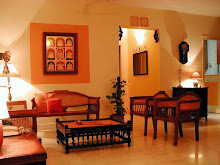 The decor looks to be heavily inspired by Portuguese, what do u say.